Umm I’m going to go with a Snowball, I know cheesy retro but I love the cherries on a stick and my granddad made a mean one, with lemonade, felt so grown up having those! In full agreement with you there. Love a snowball. So a treat; mince pie or Christmas pudding? Mince pie and a ton of thick brandy cream please. Tell us a bit about yourself then Amanda. I’m a mama to twin boys who is still trying to figure out what I want to be when I grow up. I’m creatively minded and hope to make something of all the random ideas currently flooding my head. 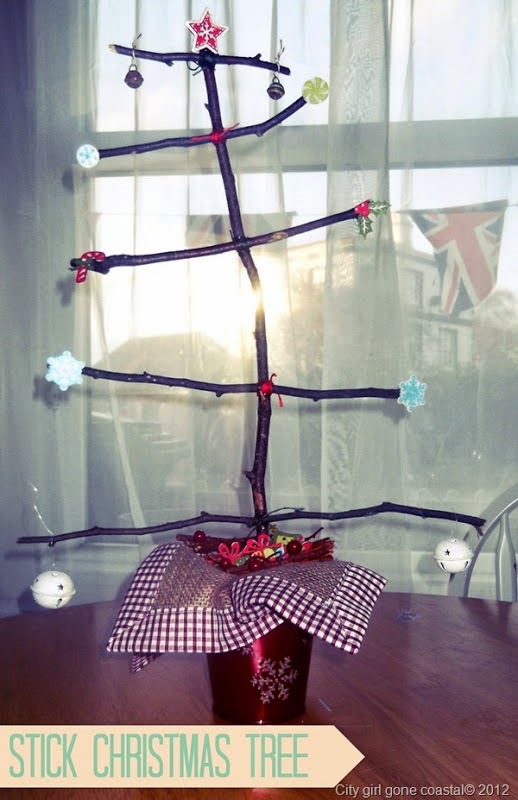 A Christmas tree made of twigs! And what was your inspiration for the item? I love bringing the outdoors inside and this seemed like an easy way to do so, now I’m thinking of making one from my ridiculously vast driftwood collection. I don’t have one particular craft style, I do anything from weaving, woodwork to painting and sewing and am self taught in whatever it is I do. I’ve always been creatively minded but it wasn’t until my PND got very bad that I decided to use crafting as a coping tool. It’s been incredibly therapeutic. I am passionate about crafts for therapy and especially in the context of PND. So where do you craft? Do you have a designated space or room? My crafting spot is usually on the living room floor or out in the garden if I need power tools, I always make a ridiculous mess so need lots of space! Where can the Crafty B’s come and find you online? It’s all early stages but we’re hoping to start a family business! Other than that my plans are just to be happy. I don’t actually know yet.. we might be at home, in which case hubs will do the cooking, or we might be staying with family! Really should make some plans. Not really, I just try to enjoy the moment and not get too bogged down in reflecting on past Christmas'. The cosy feeling when my little family are all together. … already started, but still more to do! … Ethan being home for his first Christmas, it was touch and go for a while as to whether or not he’d ever make it out the hospital. … not sure I’ve ever got a bad present, can’t think of anything, ohhh my mum got me pjs once which were a billion sizes too big, that was kinda bad. … so long as there are roast potatoes & carrots, yorkies, pigs in blankets and stuffing balls I’m all good. … Fairytale of New York and all the cheesy carols too. … a tiny wooden train ornament I got from the family Christmas tree, one of the few things I have from my dad. … some of my most memorable Christmas’s are memorable for the wrong reasons; deaths and homelessness. I’m slowly but surely making them memorable for better reasons, thanks mostly to my lovely hubs and wonderful children.